The Earth Defense Force games have been running for a couple of generations now, but rather than being a truly new game, Earth Defense Force 4.1: The Shadow of New Despair is more akin to a HD remake of the older Earth Defense Force 2025 that released several years ago. The games are fun but flawed, accessible yet repetitive. This latest iteration of the game is enjoyable, but you might as well check your brain at the door. You really will not be needing it much here. Related reading: Tank! Tank! Tank! is an old game on the Wii U, now, but it's a similar kind of game for people that enjoy Earth Defense Force. There is a B-movie, sci-fi schlocky nature to Earth Defense Force that is ideal for creating a cult following, and that is just what the series has done over the years. The plot really does not get much deeper than "save the world from giant bugs! ", and it is punctuated by funny if often ridiculous dialogue while playing the game, but then, that is the point. This is a game that is pitched purely towards people that either laughed at, or with, the horrible science fiction and monster films that came through Hollywood in the 40s, 50s and 60s. It's a game that deliberately channels the likes of Ed Wood, and there is a certain artistry to that. There is a certain aesthetic and delivery style that marks these kinds of films as a very distinct genre of their own, and by tapping into that, the Earth Defense Force series - including 4.1 - deserve to find an audience. Touted as a complete reworking of the original game, though, I struggle to see too many people, beyond the most diehard of diehards, finding much reason to come back to it. I really could not pick out enough differences to be incentive to play again. There are plenty of levels, though they will be too familiar, and the visuals certainly got a much-needed facelift. But as an upgrade, I'm not sold on the later; I absolutely loved the destructible environments and some of the hulking, ridiculous swarms of bugs and bots, but I would not go so far as to call Earth Defense Force a pretty game. 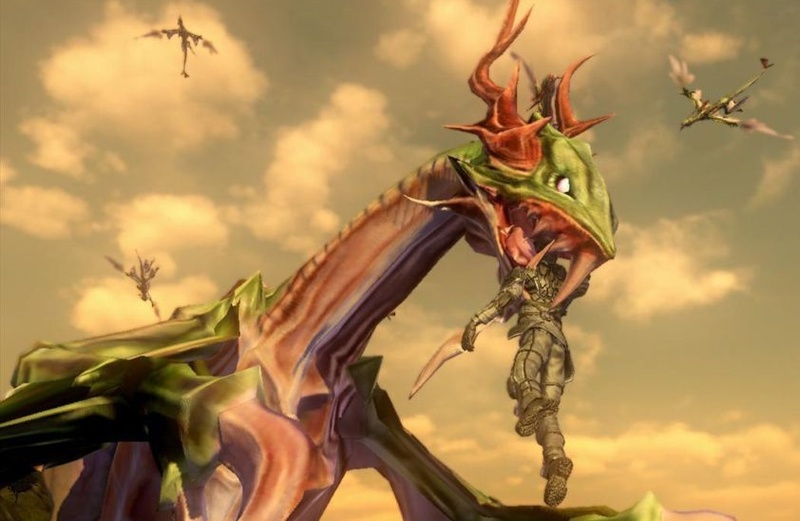 The biggest issue (outside of the framerate, which simply cannot handle all of the action on the screen during big battles), is that a lot of the animations can best be described as janky, as though the characters could have used a couple weeks more development time to get some fluidity into them. 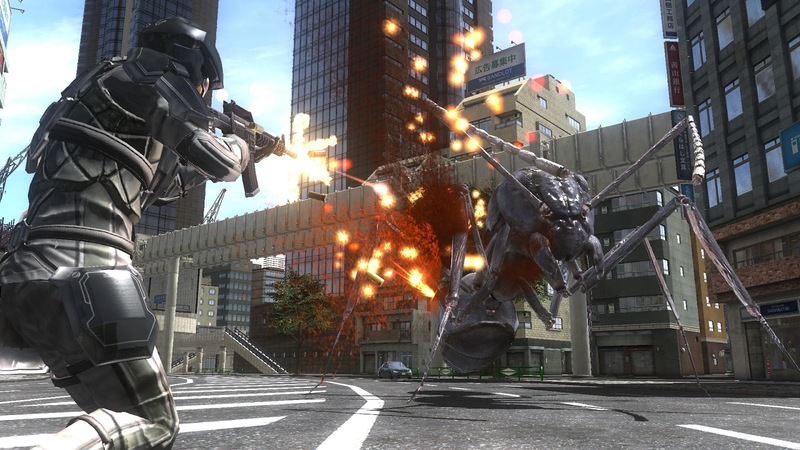 For a game about killing bugs, it's almost tempting to suggest the bugginess of Earth Defense Force 4.1 was a deliberate joke, though it's not one that actually makes for a good gameplay experience. Enemies twitch about, and move erratically at times. Other instances of bugs flipping over and glitching through buildings are even more immersion-breaking. On a handheld console, such as the PlayStation Vita, Earth Defence Force might have gotten away with a lot of this, but on the big screen bigger flaws are more readily noticeable, and given some of the gorgeous games we have seen put out by the PlayStation 4 over the last year, even when produced on a small budget (or upscaled from even PSP hardware), it's more difficult to forgive the general "cheapness" of the game at a technical level. So what about the gameplay? If you have played a third person arcade shooter before in your life, you have a pretty good idea what to expect by enlisting here. There are four different class types that you can control in battle, and these do a solid job of offering alternate styles of gameplay. The ranger, air raider, fencer and wing diver all fall into character archetypes that we've seen before (all-rounder, tank, support, technical-but-powerful), but being able to customise the classes with my new gear is actually a great deal of fun, and I looked forward to trying out something new when the opportunity presented itself. The best feature is one of the game's most curious decisions. Playing with friends online is great, but instead of being able to bounce in and out of the scenario in single player or multiplayer modes, the game runs these two basically identical modes in parallel. Instead of being able to play a couple of levels with your friends, but then picking things up where you left off in solo mode, you have to wait for your friends to hop back on line again to be able to continue your multiplayer campaign through the narrative. This was a questionable design choice. One of the aspects of the game I was most looking forward to were the hulking monster-versus-mech battles that were also promised on the package. The potential here could have been awesome, but unfortunately these encounters (though thankfully somewhat far and few between) become a missed opportunity. Instead of anxiously looking forward to them, I grew to dislike these battles because of how awkward and slow it is to control the robots. I realise that we are talking about massive robots and it makes sense thematically - but it simply does not execute well in action. The mission structure has you taking on all kinds of crazy, escalating odds. Additionally, the missions become more diverse and entertaining later in the game. The earlier levels are geared towards making the experience accessible. This works, but the lack of variety early in the proceedings does help to set a repetitious tone that does thankfully improve over time. This is especially true if playing with your friends, since the different classes are clearly constructed to compliment each other, just like a raid party in an MMO. That's not the only MMO comparison I'd make, either; there is also the need to spend plenty of time grinding through some of the less interesting levels if you want to acquire some of the best gear in return. These are tied to the difficulty settings, and gave me a solid reason to dive back into the fray and challenge myself further. Related reading: For another example of a B-grade game on the PlayStation 4, check out Onechanbara Z2: Chaos. 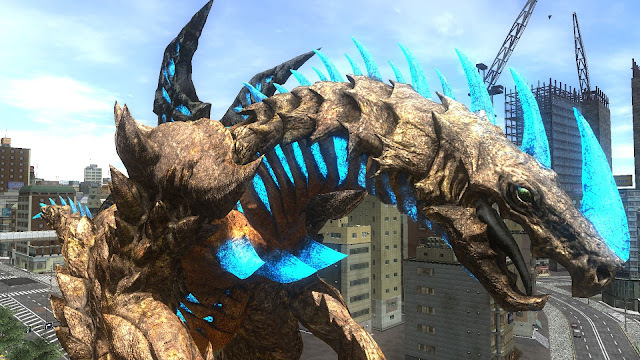 I highly recommend playing Earth Defense Force 4.1: The Shadow of New Despair with a friend or three. And then, only if you're all fans of incredibly cheesy science fiction films. If you can get the right group together, the fact there are over 100 levels to play through means this will be a lot of long-lasting fun. The team behind this game knows exactly what it is trying to deliver, and in terms of the pacing and explosive combat, Earth Defense Force usually delivers nicely. Item Reviewed: Review: Earth Defense Force 4.1: The Shadow of New Despair (Sony PlayStation 4) 9 out of 10 based on 10 ratings. 9 user reviews.